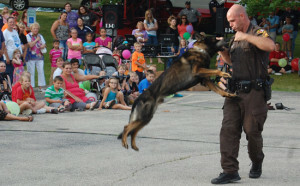 A K9 demo from a past National Night Out in Twin Lakes. The community is invited to join Twin Lakes Police, Fire and Rescue personnel for National Night Out on Tuesday, Aug. 2 at St. John Catholic Church on North Lake Avenue, Twin Lakes. National Night Out is a national initiative to bring residents together to get to know public safety personnel and neighbors as together we can create a safer community. Twin Lakes National Night Out festivities include public safety demonstrations, free food and music. National Night Out begins at 5 p.m. and ends at 8 p.m.